Oh Dear Readers! Look what crossed my path yesterday at the used bookstore! A Sports Illustrated Magazine from 1963! Isn’t it wonderful? Let’s flip through it together, shall we? Here’s 1963, Master’s Champion Jack Nicklaus singing the praises of the MacGregor Woods with their exclusive penetrating impregnation method! Wow! Now that’s impressive! Golf in 1963 was sure a lot more interesting than it is now. The ad goes on to explain that the exclusive penetrating impregnation method was the most talked about club feature in golf! (Well, I should say so!) “Because it let’s you use a wood with confidence in bad lies.” Gosh I wonder if Tiger knows about this? Hey! Who doesn’t want to live in a world where shirts were only $5.00 raise your hand! Shh . . . don’t tell Mr.Sophisticated City Dweller who is wearing his Dacron Docoma Breeze shirt that the poor country bumpkins who just got off the b.u.s. are laughing at him not with him. 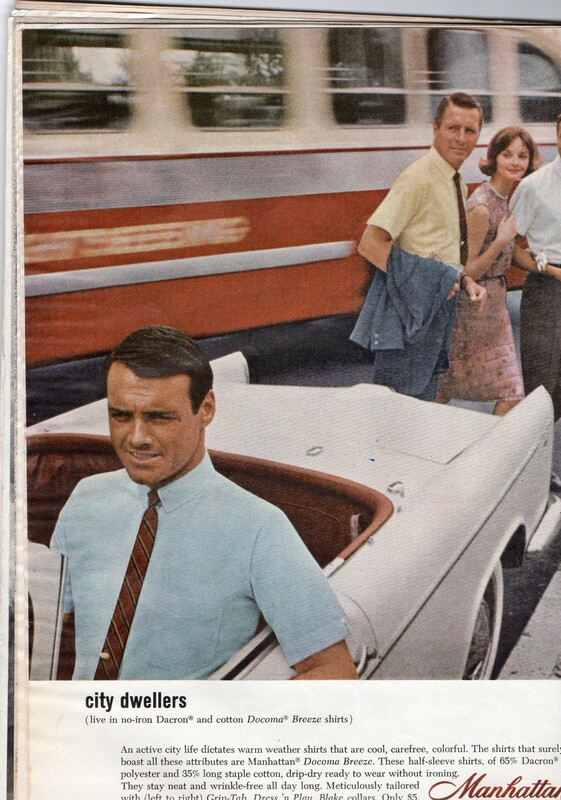 Stuffed shirts didn’t come any less wrinkle-free than in 1963 thanks to Docoma Breeze shirts boasting Grip-Tab, Dress ‘n Play, Blake collars — which only cool city dwellers could afford at $5 a pop. And if that didn’t make a man want to drive around Manhattan, mannequin-like, in a car three-sizes too small –1963 doesn’t know what did! Don’t Worry Honey! 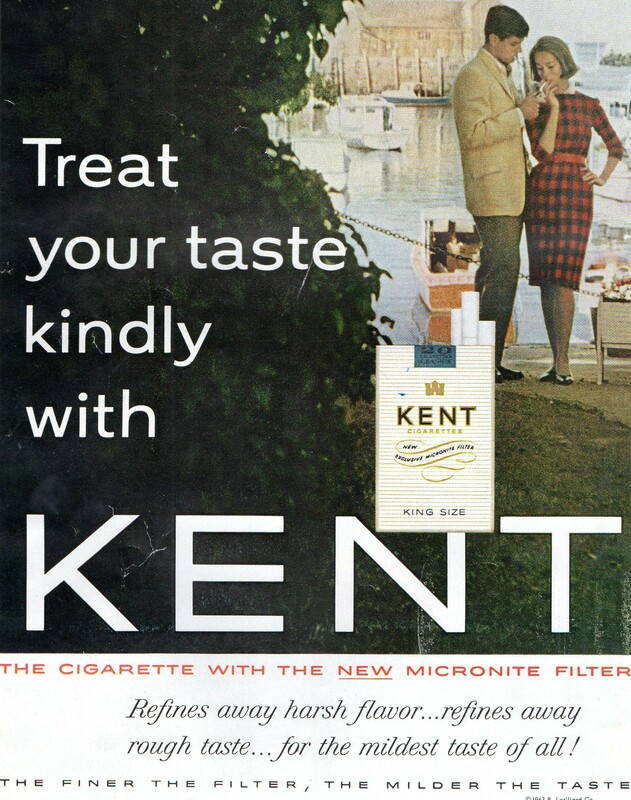 Kent’s Micronite Filter makes cigarettes good for you! This Kent ad is the very first and the very last ad to utilize the phrase “refines away”. Apparently back in 1963, the key to smoking fun was getting the cigarette to have the mildest taste of all! Kent was hoping that smokers wouldn’t put 2 and 2 together and realize that the mildest taste of all would be not smoking any cigarettes at all. Question! What’s more fun than shooting guns with daddy? Shooting guns with daddy in the house! What else? Run for cover,Sis! Look out Spot! Whoops sorry, Dear! 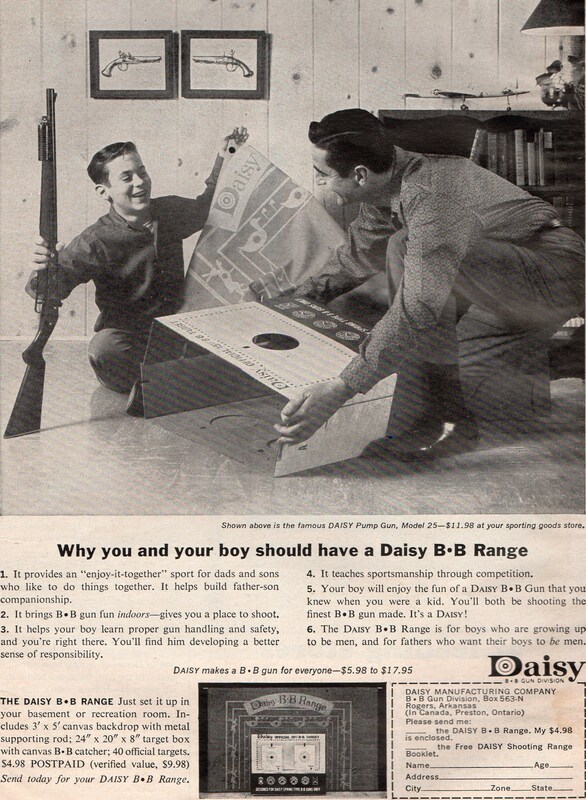 What better way for fathers to bond with their sons and to teach their sons to grow up to be men than by shooting bb guns with them in the house? Oh sure, a few of mother’s prized figureens may have to be sacrificed, and little Suzie’s buttox will probably never be the same — but it’s a small price to pay for teaching little boys what it really means to be a man — 1963 style! Now then wasn’t that fun? 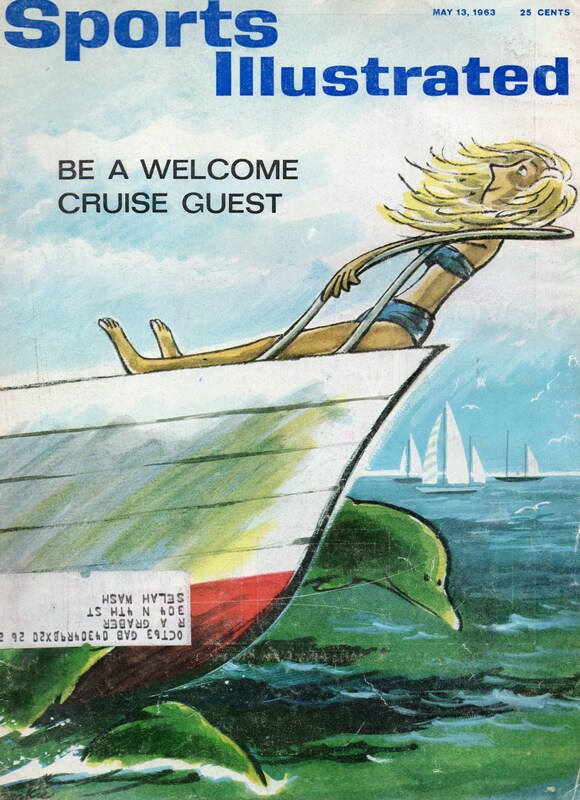 I hope you liked our little foray into the world of 1963, Dear Readers! Crochet Your Way to Happiness! Linda's List of Generic Excuses for Awkward Social Moments!